With over 40 parks and game reserves, Kenya has long been known as “big-game” country. Kenya has always viewed its wildlife as a national treasure. And the movie “Out of Africa” did much to cement the romance of Kenya in our minds. A diverse country, Kenya offers many rewards for the first-time, as well as the seasoned, safari traveler. Magnificent wildlife, excellent accommodations, palm-fringed beaches and a warm and friendly population await you. An infinite landscape of varying climates, Kenya is punctuated by two distinct rainy seasons from April to May and late November to December. Discover the dramatic Rift Valley and its soda lakes, snow-capped mountains on the Equator, the gigantic Lake Victoria and the beach-lined coast with its magical islands. Encounter the greatest concentration of free-ranging wildlife on earth and explore the customs of the proud Maasai people. It is the birthplace of the Swahili word “safari”, meaning “to journey”. Location: Kenya is located in East Africa, bordering the Indian Ocean, between Somalia and Tanzania. 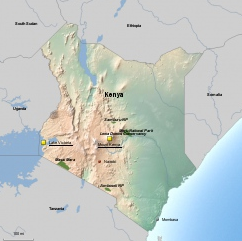 Size: Kenya covers 224, 961 square miles, slightly more than twice the size of Nevada or slightly bigger than France. Population: Just over 44 million people live in Kenya. Languages: Kiswahili and English are both official languages in Kenya, however more than 60 indigenous languages are spoken in the country. 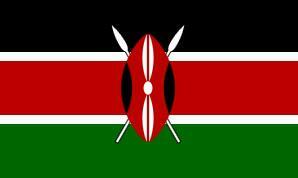 The Flag: The Kenyan national flag was adopted at independence from Britain in 1963. The color black represents the people of the Republic of Kenya, red for the blood shed during the fight for independence, green for the country’s landscape and the white was added later to symbolize peace and honesty. The traditional Maasai shield and two spears symbolize the defense of all the things symbolized in the flag. Currency: The Kenyan Shilling (KES) is the local currency, however most high-end lodges and luxury safari camps will accept US Dollars. The exchange rate hovers around USD $1: 90 Kenyan Shillings. Books: An African Love Story – Dame Daphne Sheldrick; A Guide to the Birds of East Africa – Nicholas Drayson; West with the Night – Beryl Markham; The Flame Trees of Thika – Elspeth Huxley; Out of Africa – Isak Dinesen; White Mischief – James Fox; Unbowed – Wangari Maathai; Matigari – Ngugi Wa Thiongo; I Dreamed of Africa – Kuki Gallman. Movies: Out of Africa (1985); Constant Gardener (2005); Born Free (1966); BBC’s Big Cat Diary series. Nairobi is the city at the heart of Kenya and the primary gateway to the vast game reserves and national parks of East Africa. The name Nairobi comes from the Masai words enkare nyarobe meaning sweet water, as this area was a watering hole for the Masai and their cattle. One of the largest cities between Cairo and Johannesburg, Nairobi is cosmopolitan, lively and interesting. The city center is modern and prosperous and the services are well organized and efficient. Places of interest include Kenya National Museum, Snake Farm, Nairobi National Park, Railway Museum, National Archives, McMillian Memorial Library, Parliament House, Kenyatta Conference Centre, Karen Blixen Museum, Kiambethu Farm, Langata Giraffe Centre & Bird Sanctuary. There are also many colorful markets to explore as well as the famed Carnivore Restaurant. Rich in game and birds, the Masai Mara is the scene of the spectacular annual migration of wildebeest and zebra, when millions of animals follow the unbroken cycle of survival as they move between Tanzania and Kenya in search of fresh grasses. The sight of more than a million of these creatures moving as a great mass across the savannah is one of the most breathtaking sights in nature. Visitors to the Masai Mara from August through September are certain to see the great herds of wildebeest and zebra. From the Rift Valley escarpment, to the rolling plains and the groves of woodlands, the Masai Mara is a vast and varied landscape. The Mara River bisects this great reserve and provides a rich habitat along its banks. And everywhere, the seemingly endless herds of animals live out their daily lives to the rhythm of nature. The Mara, host to lion, cheetah, hippo, elephant, leopard, buffalo, warthog and giraffe, to name a few, holds splendor and surprises within its boundaries. The visitor is sure to see why the Masai Mara is Kenya’s most famous, and favored, park. Lewa Downs is a 40,000 acre ranch, home to the Craig Family since 1924, hosting a diverse array of wildlife in some of Kenya’s most spectacular scenery. The snowcapped peaks of Mount Kenya dominate the views to the south, where the southern boundary rises to an altitude of some 6,500 ft above sea level. To the north, the terrain drops away rapidly with breathtaking views of Samburu, Ololokwe and the Mathews Range beyond. The Lewa Downs Conservancy supports a myriad of plains game species, all perfectly adapted for the semi-desert environment. The thinly striped and endangered Grevy’s zebra and the chocolate brown reticulated giraffe are common. The lance-like horned Beisa oryx and the rare greater kudu are seasonal visitors. Gunther’s dikdik, with its huge nasal swellings, the giraffe-necked gerenuk and the beautiful blue-legged Somali ostrich are resident all year. The swamp has become a sanctuary for the fascinating semi-aquatic sitatunga antelope and its primary predator, the leopard. Birdlife is equally rich with numerous species of Bustards, Plovers, Coursers and birds of prey. At night, leopard are frequently encountered along with bush babies, aardvarks, bat-eared foxes, caracal and various mongooses, genets & civets – a few days at Lewa Downs is a unique combination of hospitality, spectacular scenery and abundant wildlife. In the semi-desert bush country of the northern frontier are Samburu, Buffalo Springs and Shaba Game Reserves. These three reserves lie 325 kilometers from Nairobi in hot and arid fringes of the vast northern region of Kenya. The reserves are within the lands of the colorful Samburu tribe, relatives of the famed Masai. Furthermore, this region is noted for the unique species that live here, such as the Grevy’s zebra, gerenuk and reticulated giraffe. Some of these species are so well adapted to the dry area that they can go for long periods of time without water, surviving only on moisture obtained through their food. The Uaso Nyiro River runs through the park and guarantees an abundance of wildlife the year around. It is also not uncommon to see a hundred different species of birds throughout the park. The rugged splendor of this region is accented by the colorful dress and beauty of the Samburu tribe. These nomadic people allow a glimpse into their way of life and how they have adapted to this mysterious and adventurous region. Amboseli is equally famous for its big game as well as its views of Mount Kilimanjaro. This park is one of the best places in Kenya to view large herds of elephant and buffalo as well as lion, cheetah, giraffe and plains game. The scenic landscape is dominated by the sparkling, majestic snowcap of Mount Kilimanjaro, Africa’s highest peak at 19,340 feet. Within Amboseli National Park, you will find the Cynthia Moss Elephant Research Center which has been instrumental in our ability to understand and, ultimately, to help save these magnificent beasts. A wild region where the pastoral Masai and their cattle can be seen living in harmony with nature, Amboseli is a rich introduction to Kenya. The Central Highlands lie to the north of Kenya and include two national parks, Mount Kenya and the Aberdares, forming an eastern boundary to the Rift Valley. It is a very densely populated area, being fertile and well watered. This is also the heartland of the Kikuyu people who make up the largest tribal group in Kenya. Mount Kenya rises to a height of 5200 meters. Above the 3200 meter contour, it forms a biosphere reserve. The mountain consists of three principal zones: the rocky peak with its crown of glaciers, tarns and snowfields; the alpine zone with its distinctive giant vegetation; and the vast gentle slopes covered in upland forest and bamboo jungle. These differing environments provide opportunities for all levels of adventurers from leisurely bush walks, to more rigorous hikes as well as serious outfitted climbs. The area around Mount Kenya is also accessible to those wishing to explore its alpine peaks. Wildlife is still common here and many private reserves and sanctuaries are found in this area. The famous Mount Kenya Safari Club is located at the foot of Mount Kenya and offers a variety of activities. The Aberdares is a range of mountains to the west of Mount Kenya in the central highlands region and is one of Kenya’s only virgin forests. The Kikuyu call these mountains Nyandarua (drying hide) and they were the home to guerilla fighters during the struggle for independence. Today the mountains are home to leopard, bongo, buffalo and elephant and the lower lying areas are the territory of the lion, serval cat and even bushbucks. Aberdare National Park is known for its tree hotels and the thrill of night game viewing. Deep ravines cut through forested slopes and animals venture down at night to waterholes situated next to these hotels. The Great Rift Valley is one of the most dramatic features of the planet, stretching some 3600 miles from the Dead Sea in Jordan to Mozambique in the south. In Kenya, the Rift Valley starts at Lake Turkana in the north and crosses the center of the country to Lake Natron just across the southern border into Tanzania. It is up to 60 miles wide in places and features cliffs, escarpments, rivers and arid plains, which support an amazing diversity of fauna and flora. The Rift Valley’s system of deep freshwater lakes includes Lake Nakuru, Lake Naivasha and Lake Baringo. Lake Nakuru is known for its stunning pink vision as millions of flamingos congregate to feed in the alkaline waters. Visitors to this area will be taken with the beauty of the fever trees and the richness of the wildlife, which includes a rhino sanctuary. Lake Naivasha is home to over 400 species of birds, which are drawn to the papyrus reeds that line its shores. Lake Baringo, to the north, is also rich in bird life and other aquatic animals, such as hippo and crocodile. Laikipia is a plateau between the North Kenya deserts and the Aberdare Mountain Range. The Laikipia wildlife sanctuary is home to the largest elephant population in Kenya and was made famous by Kuki Gallman in her book, “I Dreamed of Africa”. Safaris are conducted on a private ranch of 50,000 acres of wilderness, on the edge of an escarpment overlooking plains, valleys and acacia and wild olive forests. Game drives, bush walks and horseback rides offer views of herds of zebra, eland, elephant, hartebeest, reticulated giraffe, Grevy’s zebra, Grant’s gazelle, and of course the predators such as leopard, lion, cheetah and the rare caracal. Tsavo was opened in 1948 as the first of Kenya’s wildlife reserves. Located halfway between Nairobi and Mombasa, the park is divided into two sections, West and East Tsavo National Parks. Together with adjacent Chyulu Hills National Park, they cover an area of 8,217 square miles. Considered one of the world’s premier bio-diverse microcosms, Tsavo is the largest park in Kenya. The alternately hilly, rocky and flat landscape is dotted with giant baobab trees and the desert rose. Along the riverbanks you find a thriving animal population in and around the acacias and raffia palms. This area is famous as the home of the ‘red’ elephants – colored by the park’s red dust. Game here is quite varied including ostrich, gazelle, giraffe and zebra accompanied by the predatory cats, as well as 500 species of birds. Mombasa is Kenya’s second largest – and oldest – city, with a history that dates back nearly 2,000 years. Mombasa is a mystical mixture of the ancient and the modern with a cosmopolitan population of African, European, Arab and Asian. The old town is a maze of narrow streets and pedestrian lanes lined with quaint shuttered houses and open fronted shops. The smell of spices is always present. Dominating the entrance to the Dhow harbor and overlooking the old town is Fort Jesus built by the Portuguese in the 16th century. A museum in the fort displays antiques from the length of the Kenyan coast, and is always open to visitors. As Kenya’s oldest living town, Lamu has a rich and colorful history. Lamu is a town, an island and an archipelago. The physical appearance and character of the town have changed little over the centuries. The architecture of the houses and buildings dates back to the 18th century. The villages of Shela and Matondoni, Lamu Fort, the Swahili House Museum, and the Donkey Sanctuary should also be included on every traveler’s itinerary. Today, Lamu offers an excellent opportunity to experience an ancient and fascinating town, inhabited by friendly and colorful people as well as the sea, beaches, antiquities, marine life and nearby islands. Take a dawn swim on the world’s most beautiful beach, explore the shipyards of nearby Matandoni, shop in Lamu Town or plunge into crystalline waters to scuba or snorkel.